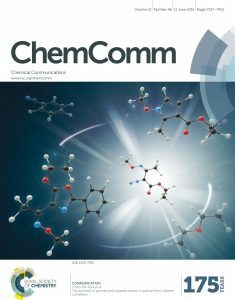 The work by Prof. Cheol-Min Park (School of Natural Science) has been selected to appear on the front cover of the Journal of Chemical Communications. From left are Prof. Park and his student, Subin Choi. Featured on the front cover of RSC Chemical Communications. A new research, affiliated with UNIST has been highlighted on the inside front cover of the June issue of the prestigious journal “Chemical Communications”. The key finding of this study is the development of new synthetic methods that facilitate the design and synthesis of bioactive compounds and chemical tools for pharmacological studies, the team reports. The study was jointly conducted by Prof. Cheol-Min Park of Department of Chemistry at UNIST, Prof. Nicole S. Y. Loy of School of Physical and Mathematical Sciences at Nanyang Technological University, and two other researchers. 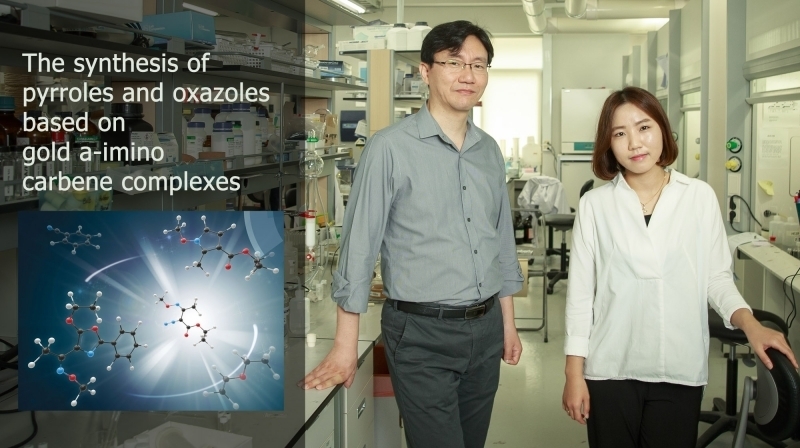 In the study, Prof. Park’s team addresses the importance of developing a new simple synthetic method for chemical compounds, as it plays a significant role in drug discovery. Prof. Park’s work has been selected to appear on the front cover of the Journal of Chemical Communications. The synthesis of pyrroles and oxazoles are also known as bioactive components, the team reports. In fact, pyrroles have been used to treat a number of medical conditions, as they possess a broad spectrum of biological activities, such as antidepressant, anticarciogenic, and psychoanalytic. Oxazoles also show the following biological activities, such as anti-influenza virus and cytostatic activities. This work has been supported by the National Research Foundation of Korea (NRF), the 2016 Research Fund of UNIST, and Nanyang Technological University. Nicole S. Y. Loy, Subin Choi, Sunggak Kim, and Cheol-Min Park, “The synthesis of pyrroles and oxazoles based on gold α-imino carbene complexes.” Chem. Commun., 2016.